This has been the most recent addition to my stable of rides which is why there have been recent Squatch sighting all over the Chicago area. What I love about this the fattie is that allows me to change my ride mindset. Going from all out full speed ahead to riding areas, situations and conditions I would not be able to do otherwise. And using other parts of my body to maximize my workout. 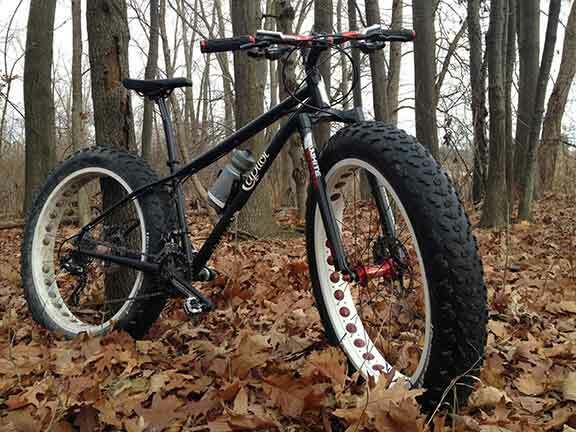 This Squatch was hand built by Capitol Bikes in Cuyahoga Heights, Ohio- yep that’s in the good ole U.S. of A! The guys at Spokes have worked with John Mastrobuono, the owner and framebuilder to create what they consider an ideal blend of trail and fat bike. I’m not sure how ideal it is compared to others but I will say with my limited trail skills this thing handles unbelievably well. Extremely nimble handling, super fast and agile it attacks the trails with confidence and travels over anything. It allows me to pace is hard as I want without hesitation. The faster it takes the trail the better bike responds. 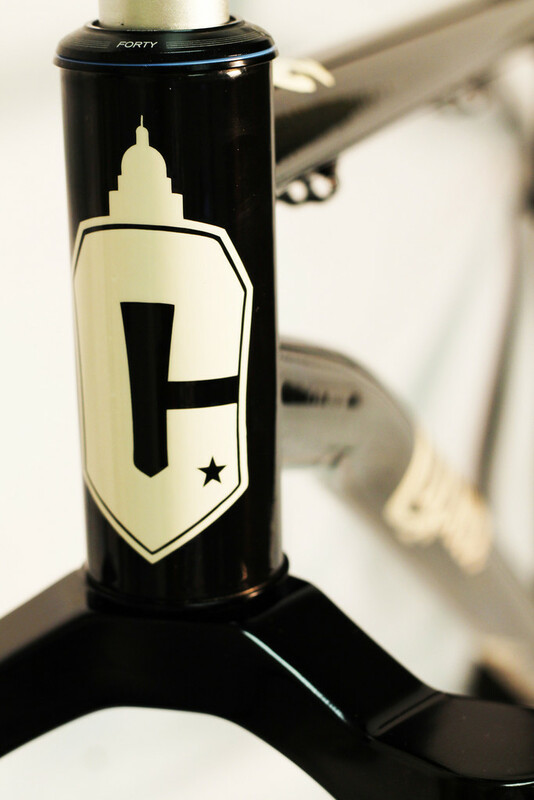 This is a Columbus steel frame paired with a White Brothers Snowpack carbon fork. Equipped with Shimano SLX hydraulic brakes and trigger shifters, XT Front and rear Derailleurs. The Origin 8 rims are built upon Hope hubs. A Fizik Gobi XM saddle sits atop a Thompson setback seat post and Race Face crank and bars pair up well together. 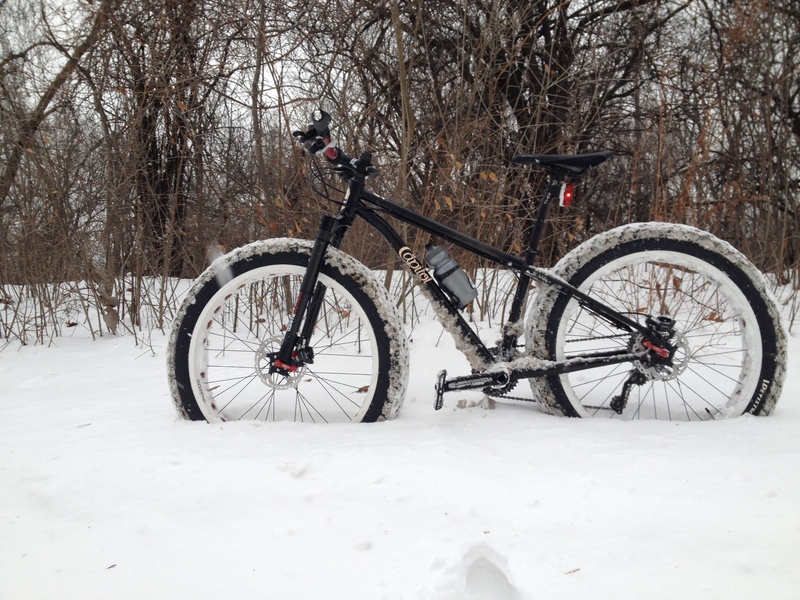 Right now the bike is chewing through ice and snow on a pair of 45 N. Dillinger 4 inch studded tires. Probably the single best investment I’ve ever made on any bike. I bounce between Shimano SPD clipless peddles and a pair of Race Face Atlas platforms. When the snow is a little too deep and I find it tricky to clip in and out quickly so the platform are a lot easier- they sacrifice some efficiency but at that point, c’mon I’m riding a bike with 4 inch tires!!!!! Over snow this thing is a heck of a workout but it is a pretty amazing experience- especially if you are riding during a nighttime snowfall- purely magical. Extremely nimble handling, super fast and agile it attacks the trails with confidence and travels over anything. 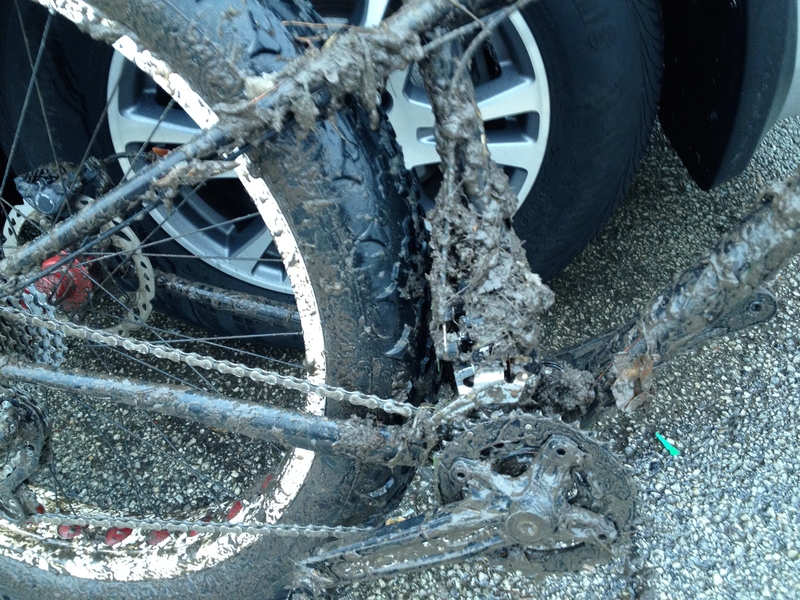 My first week of owning the bike I decided to take it out for a cyclocross race. I learned a lot that day about tire pressures and the major differences between a fatty and all my other bikes. All in all a great learning experience and a really great excuse to get filthy dirty. If you’re looking for a bike I would highly recommend adding a fatty to your stable. and if you have a chance you may wanna check out the Squatch! This bike costs twice as much as my first car and I think it has wider tires. Unfortunately, it still costs more than one of the cars I have now!